Writing JSF components is hard and complicated. No one in their right mind writes them. Except when you are a framework developer. My team is struggling for some time now with Primefaces and its (natural) limitations where one cannot simply change the HTML output to the designers need. So, I spent some days this fall, to try to replace PrimeFaces components with an angular solution, so that PrimeFaces can be completely removed from the application and all components like dialogs or growls are replaced with angular directives. I didn’t want to use AngularFaces as its trying to put too much magic into the application (for my personal taste). Its very interesting on paper, but when you use it, it seems that every single developer needs to understand exactly both lifecycles of JSF and angularJS and how both frameworks are working. This seems to be a challenge for every decent sized team. Luckily, the XML parser of JSF leaves HTML tags it does not know of (aka: angularJS directives) alone and just outputs them in the rendered HTML. In a way, that works like the passthrough attributes in JSF 2.2.
adding the ng-app attribute to the h:body tag is not possible when not using JSF 2.2, Solution: manual bootstrapping like described in angularjs documentation or wrapping your JSF template with a div and the ng-app attribute. Besides the first, the last two problems were the challenge. When you load angularJS on page load in a JSF page, its working as expected: its doing its thing and enhances the DOM according to the registered directives. If you don’t use any AJAX requests at all, you are basically done. The challenge with AJAX requests is, that angularJS needs to be informed about those changes, as they happen outside of an angularJS digest but can contain new DOM nodes with angularJS directives or are destroying/changing existing directives. AngularFaces solved it in a brute-force-like-way: the angularJS app will be completely destroyed and recreated after every JSF AJAX request. But as I only wanted to use directives, that seemed a little harsh for me. when ajaxComplete event happens, the DOM nodes that are updated by JSF are still unchanged. JUA will iterate through them, searching for nodes with a scope or isolate scope and call the $destroy method on those scopes. Destroying of scopes is done by angularJS itself. when ajaxSuccess event happens, the DOM nodes that are updated by JSF are successfully updated and this library will compile them via angularJS $compile service. The result is that even DOM nodes which are updated via JSF AJAX requests are enhanced by angularJS directives. The current state of JUA is not production ready. It was only tested on a few developer machines in a Mojarra JSF 2.1.7 environment (JBoss 7.1.1.). But as I don’t see any JSF dependencies, it should work with any JSF version, provided the JSF AJAX event listener callback interface was not changed. When not using JSF 2.2 angularJS directives (aka HTML tags) can’t have JSF IDs and therefore can’t be the source of an JSF AJAX request. But even with JSF 2.2 or when you use a JSF component as a source, you have to build the requests yourself, which is … not so easy. Use OmniFaces. Really, this library is great! Re-implement your application in angularJS instead of JSF. Use o:messages of OmniFaces to output JSF messages to mimic the PrimeFaces growl component. With o:messages you can control the HTML output of messages and can give an angularJS directive all needed parameters to mimic a growl message. Apparently angularJS itself tries to read the userAgent even when running inside a mocked environment. The navigator property of the jasmine mock object will be the original navigator property of the original window object. Smells a bit, but works. I did it all wrong in my first angularJS application. Oh I did it really wrong! Since then I tried a few different approaches and while experimenting with ngStart as a skeleton for new angular projects I’m now settled with an approach I want to use in all my next projects. What I came up with, is an approach that groups features into angularJS modules. The main advantages is that the code structure is based on features of the application and every feature is defining its own angularJS module. 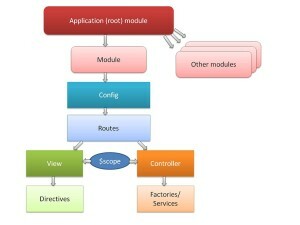 The angular root module then is the glue and binds all modules together. Each angular module can use the full list of angular features. It can have its own angular.config() phase function, can declare its own routes and can have its own list of dependencies. To refactor a certain feature you now know exactly where to begin and what files are directly dependent on each other when they implement a single feature. You can move modules around and even move them out of the your first single-page app, make another app and declare a dependency on the module to reuse your code. In a small and trivial example the advantages of this approach are not easily visible, but as soon as a team of developers works together on an application it will grow very fast. But as frontend engineers or frontend developers of today, you should care! AngularJS is great. But angularJS applications will face the same problems as every other application that begins to grow. And your structure should make it easy to grow and adapt. You should care from the beginning! I just released a new patch version of my angularJS sekeleton project ngStart. It now contains a sample unit test for a controller. that the controller is not registered by name as its usually done in simple projects, but the controller is defined inside a route definition without an explicit name. The controller is only valid for the given route. As far as I know, you can’t access it via a name anywhere outside. How do you test the controller now in a unit test if you can’t access it via name? As we can load the controller definition with requireJS (aka its function representation) you can give the $controller function this controller function directly. You don’t have to provide a string which angularJS uses to look for a registered function like its done with a call to angular.controller(“name”, controllerFunction).